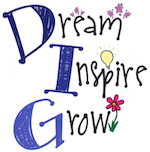 Join us for an exciting family child care conference featuring high quality educational presentations, dynamic workshops, and professional networking opportunities - all specifically geared toward family child care providers like you! In between sessions visit the exhibitors for learning materials, supplies, and services that meet the unique needs of family child care programs. Whether you are a family child care provider or work in a group center, new to the field or have years of experience, this conference is for you! Chula Vista Conference Center, Wisconsin Dells. The complete 2019 Conference book can be viewed and downloaded on the Conference Book page. Registration is still open! Click here to register. Click on the video below for more information about the conference. Click on the flyer image to download a copy of the flyer. Use it to invite friends and colleagues to the conference! Join us on Friday, May 3, from 6:30-8:30pm in Rooms G, H, I (combined) for a special screening of this groundbreaking documentary. No Small Matter is built from stories of real children, families, and teachers, illustrating the impact of high quality early childhood experiences. This free event is open to the public, so download the flyer and invite your families, colleagues, friends, etc. Thank you to our sponsors. We couldn't do it without you! Thank you also to those who donated at individual levels. Your contribution is appreciated! 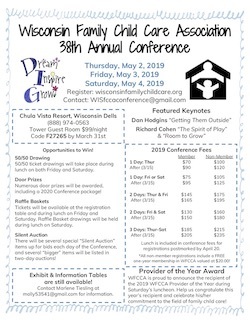 Interested in supporting the WFCCA Family Child Care Conference? Exhibitors, Sponsors, Silent Auction baskets/items, and miscellaneous donations are always welcome! Download the appropriate information below, or contact us for more information.